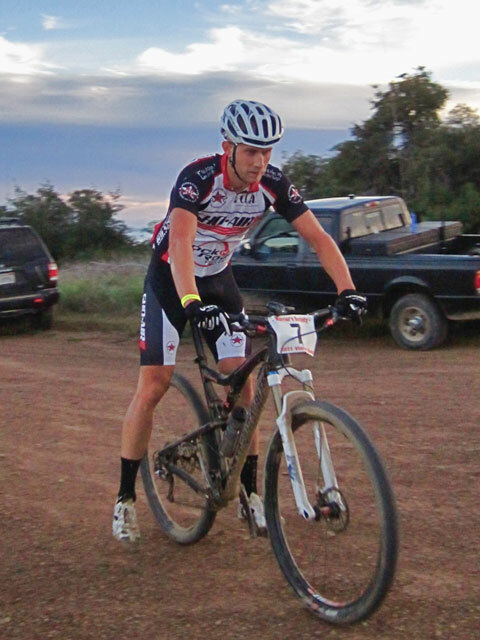 Despite the record rains and the resulting damage we managed to pull off the 2011 Mountain Bike Pow Wow. 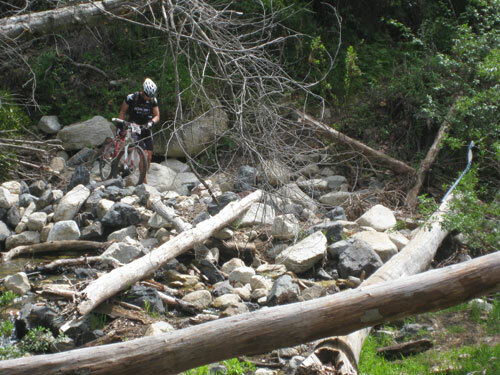 The first climb up Black Star Canyon Road was a real challenge this year because of the damage caused by the rain; it has never been in this bad of shape. We went out a week before the event and hiked down from Beeks' (the road was impassible by car) and repair one particularly bad washout where two pipes had been undermined and there was a 24-foot chasm on the road. There was a concrete headwall that was about 2 feet wide to walk across and we decided to create a bypass route down and back up from the creek. This bypass would also allow our support motorcycles to ride all the way to Beek's place, because unlike the bikes, they couldn't walk their motorcycles across the headwall. Club member Matt went up the day before the event to mark out where the bypass was (as well as the other washed out areas) but a local resident, who we will call "Art," pulled out the warning tape after he left. From what I understand, riders missed the unmarked bypass and bottlenecked trying to get across the headwall. 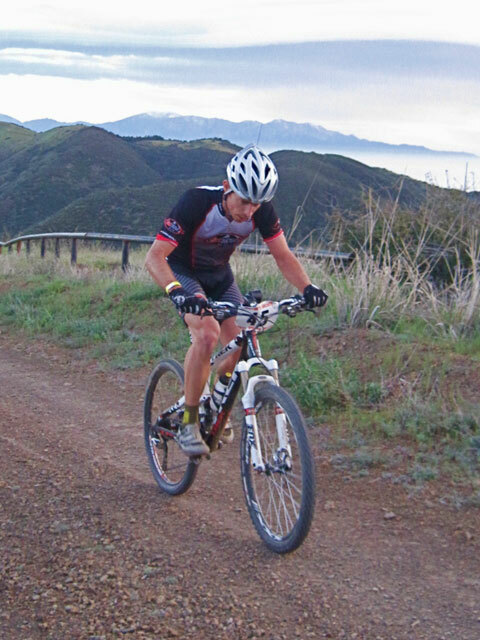 The rest of the course was not in bad shape and the weather provided good conditions. For the first time we moved the finish line into O'Neill Park and this really made for a more festive finish. We had a few bumps with the move but next year we'll reserve the group areas adjacent to it to allow more parking and also have port-a-potties for the spectators so you won't have to walk so far to the rest rooms. The finish line photo of participants will also return. We appreciate your patience with ironing out the bugs with our new finish area. 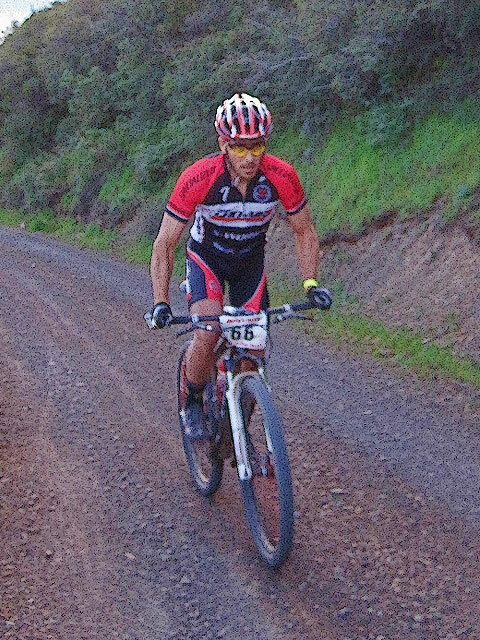 I don't remember exactly how many years ago, but after riding Vision Quest for a couple of years I opted to volunteer to support the event. 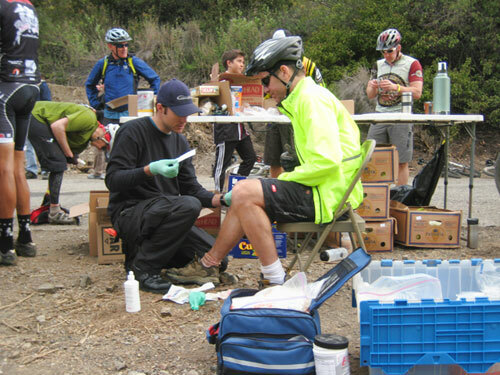 If I recall, the West Horse Thief checkpoint/aid station had been manned by Joe Lopez. I think his duties had expanded requiring him to relocate in his support role so it opened an opportunity for me to work that location which is one of my favorite places in the local forest. 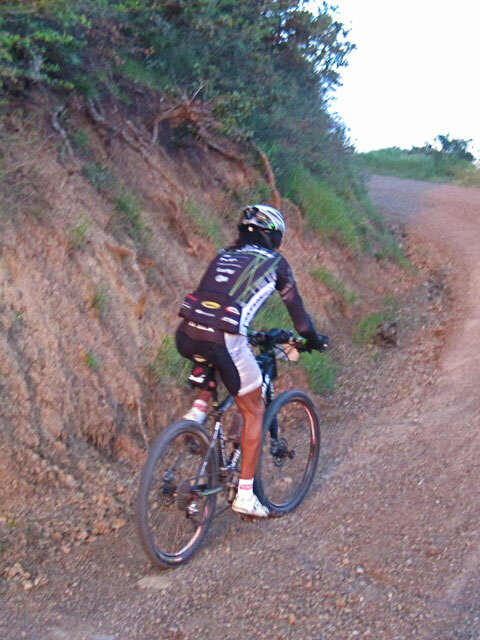 I knew from my riding experiences that this would be one of the best spots to experience the race vicariously through the struggles of the participants. 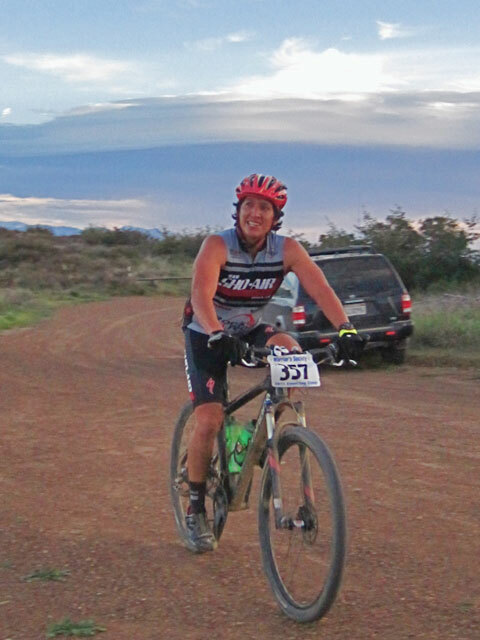 For me, arriving at the top of West Horse Thief was the point in the race where I knew I had made it, even more so than the finish line. In preparing for our day up there, I gave consideration to what I should bring (in addition to water, Cytomax, energy bars, fruit, etc. for the riders) to allow us to enjoy the day. I remember noting that none of the support food was appealing to me when I arrived at West Horse Thief so decided to buy some salty potato chips and Fig Newtons to hand out. real food! I realized I had quite a few left over burger patties, buns, etc. from a party at my house (maybe 20-25). So I brought my barbecue along and figured I would just bring all the stuff in case some of the motorcycle support or radio guys wanted any. We fired up the grill in the late morning. 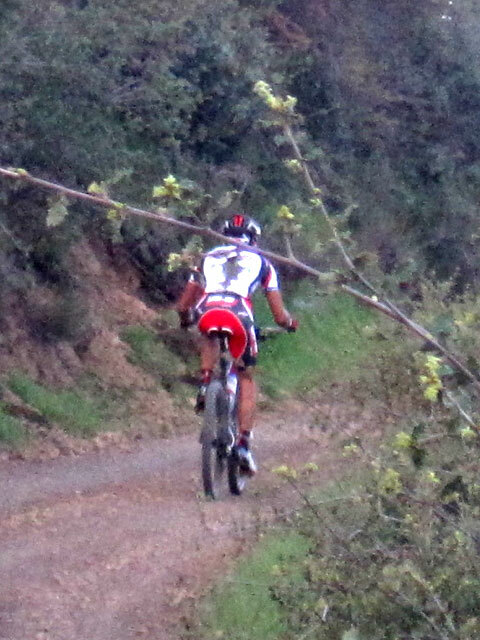 Apparently, the way the wind was blowing the riders could smell the burgers cooking while hiking up the entire trail. People would comment how good they smelled so we offered them a burger and cooked more and put them on the table. Needless to say, they all got eaten and if a rider couldn't finish it, my dog Otis was there to make sure nothing went to waste. Hence, a tradition was born. Every year since we have gone through no less than 60 burgers. I am not even sure how long I have been doing it at this point. The last couple of years, my wife and kids (ages 6 & 4) came with me to help and just had a great time. and of course Otis our dog. This year it was a great day up there. A little frantic on the set up with the key to the gate being an hour late but we were totally prepared by the time riders got to us. 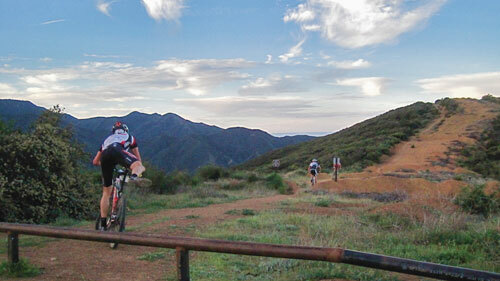 Had a couple riders show up who turned left at the bottom of upper Holy Jim who we sent back. Mark was a great help and a fun guy to have up there... he kept the burgers coming. All told we went through 77 burgers and all the fixings, 2 big bags of salty chips, multiple boxes of fig Newton's and 2 big bags of oranges. With me was my wife Jennifer along with my kids Jessika and Brett. Dan Gallagher was there along with his son Cody who probably caught 10 lizards throughout the day. The kids did a great job calling out number plates as the riders approached, Dan, Lare-Dog, Mark, Jenn and myself made sure all riders had ready to drink water and Cytomax, filled up their bike bottles and camelback bags, cut oranges and most importantly prepared their burgers as requested." The top 25 "racers" look at us like we are crazy when we offer the burgers. The rest of the "riders" are pretty appreciative. As the sign says "Warrior Burgers. Free. If you complain. $10. About six Friday night Matthew my son in-law called wanting to know if I had room for two more. He wanted to bring my oldest grandson, Dustyn along. I'm been wanting to get Dustyn on the hill for years but my daughter has been very hesitant in letting him go with us. 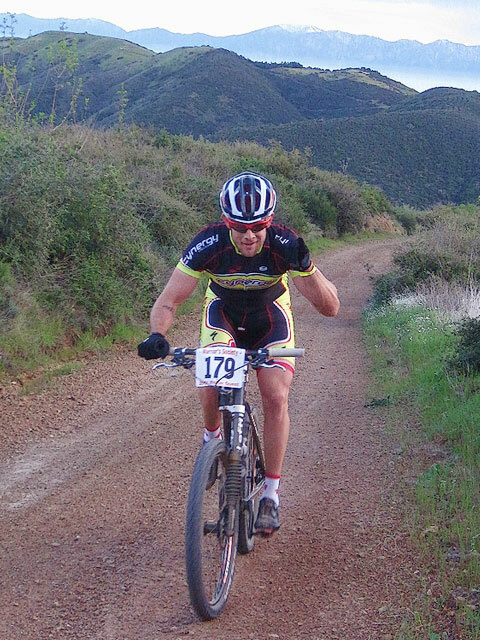 Dustyn lived up to my expectations and did a great job of spotting bib numbers and warning riders about Trabuco Trail. One funny thing I noticed, when Dustyn asked a rider if they needed anything, they answered. When I asked, a good portion would ignore me a keep on going. All in all it was a great day for me. In the Vision Quest Tinker Juarez was first with a time of 05:10:44, Dana Weber came in second with a time of 05:13:33, Manual Prado came in third with a time of 05:18:51, Doug Andrews came in fourth with at time of 05:24:57 and Nate Whitman came in fifth with a time of 05:37:51. Tinker had this to say about his win. 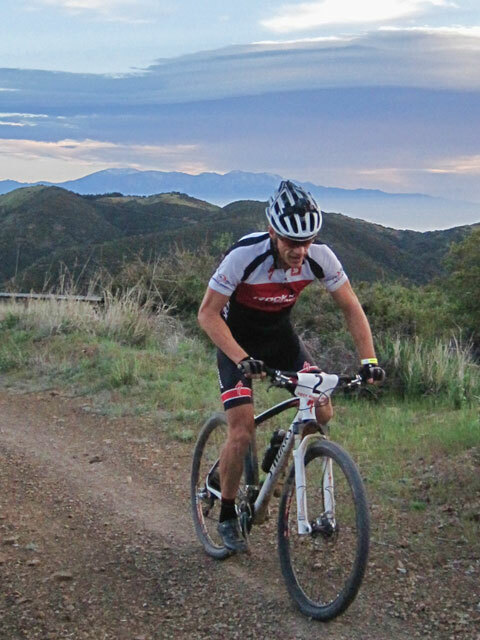 The Silverado Modjeska Recreation and Parks District (SMRPD) provided a gift certificate to the last place rider Eric Young who had tried 6 times to finish this race and never made it until this year. In addition to the gift certificate to recognize his determination to finish and we presented him with "The End of the Trail Award"
In the Counting Coup Mario Correa came in first with a time of 03:56:56, Jon Flagg came in second with at time of 04:22:18, Derek Nye came in third with a time of 04:22:40, Eric Parks on a single speed came in fourth with at time of 04:37:18 and Jon Clark came in fifth with at time of 04:42:27. 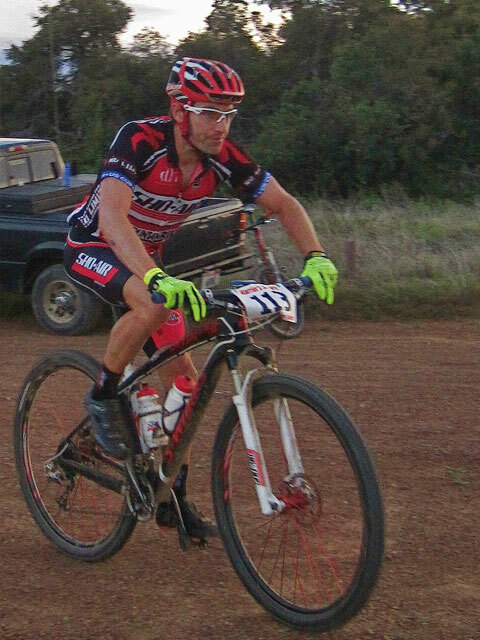 Jens Raz wrote the following article on the event on MTB Race News. We really appreciate all the work our Timing Director Suzanne Martin does for our events. On the day of the event Suzanne Martin lost her beloved mother, who died on her 82nd Birthday! Should we all live to be 82! Suzanne held strong during this difficult time and was at the Pow Wow start making sure all the participants got their packets and started our timing process. Then she went over to O'Neil Park with us and showed Regina, Jason and Nathalie how the timing needed to work to make the event go off without a hitch. Suzanne then went and spent the last hours at her mother's side. Please keep Suzanne and her family in your hearts during this time. The event transfer fees raised a total of $1,790 for the Freedom Alliance Scholarship Fund. Due to problems related to the transfers, including people selling spots for more than they bought them, we will not be allowing transfers in 2012 for any of our events. I personally want to thank all the Warrior Members who assisted in another successful Pow Wow! I know I threw some new stuff in by adding the finish at O'Neil Park, a "Baja" finish through the creek bed and added some new volunteer positions that required lots of work. Without all of you out there on the course this event would not be possible. But then the event day comes and I watch the members ban together and pull it off! 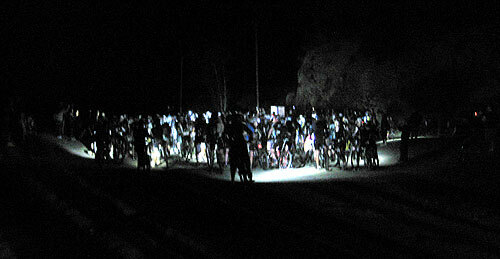 I watch the participants ride off into the darkness at the start line with smiles and anticipation of finishing the hardest event they have ever attempted. I watch the motorcycle volunteers take off behind them all as they head up Blackstar and I know that we did it again....we pulled another event off... because I know that our wonderful club of Warrior's will get them through the rest of their day in the Santa Ana Mountains. Watching all that each and every one of you Warrior members and our volunteers do for the participants and making sure that they make it to the finish line safe makes it all worth it! There is nothing better than watching these participants come across the finish line reaching their Vision Quest or Counting Coup goals. But most importantly, knowing that our club of Warrior's and volunteers has gotten them there makes me know I must continue to do my part in this wonderful club. Once again, thank you to all who helped make this event run smooth.....and we will continue to make efforts to keep this "well oiled machine" keep running for years to come. Sherry Panttaja "Stands Her Ground"
We are thankful for the support of our Major Sponsors El Pollo Loco, who provided an excellent lunch, Shimano (they've supported us from the beginning), Cannodale, O'Hara's Pub at the Orange Circle, Rock and Road Cyclery (who provided repairs at Aid Station #1), Switchback Cyclery, the Silverado Modjeska Recreation and Parks District and The Other Room web design. Many thanks to SMRPD and President Ron Shepston and SMRPD and Warrior's Society policy consultant Mike Boeck for their support! 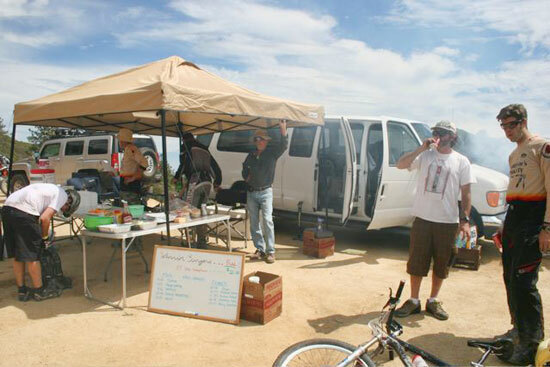 We'd also like to thank our minor sponsors, Reach Air, Cynergy Cycles of Santa Monica who provided their van for the shuttle, Okole Stuff, Denis Duty Fabrications, BRC, Coca Cola, the SHARE Mountain Bike Club, Oakley and Be True Foods. Thanks to all those who helped with the trail work prior to the event including Ned Reynolds and Gene Frial our Trail Work Directors. Ned also stored the water for the event at his house and, despite recovering from bad stomach flu, helped deliver it to Aid Station #1. Gene also helped out at the event at the Trabuco Canyon Road crossing. Thanks to our volunteers who helped make this event possible; Medical Director Carrie Harden, motorcycle support Gary Palmer, motorcycle support Tim Panttaja, and Bob McCarter roving medical support. Starting line staff Regina Froemmling, Jason Martin, Suzanne Martin, Nathalie Clericy, Eron Boyer, Barry Wood, Reed Price, and Jordyn Panttaja. All of these volunteers also worked multiple assignments at Aid Stations, the finish line or as course marshals after the start. Treve Misemer Aid Station #1 Director (who also worked the crossing), Kathy McNeill Assistant Aid Station #1 Director, Aid Station I volunteers Andy Lightle, Bob Hale (who was also our shuttle director), Pete Allen (co-founder of the Warrior's Society who was also a shuttle driver), Troy and Jim Sladeck, Brian Empter motorcycle support, Ryan Leopard EMT, and Four Corners check point Director Steve Foster. Ken Rands Aid Station II Director and Communications, Aid Station II volunteers Matt Forest, Jeff Parish, Robert Otancz EMT, Jesse Vargas and Gregg Howard. Sweep riders Hal Sintov, Lobos Durdovic, Bob Rust, Chris Hanson, Mark Cluttey, Keith Eckstein (who also worked the crossing), Barry Wood and Matthew Nourmohamadian. 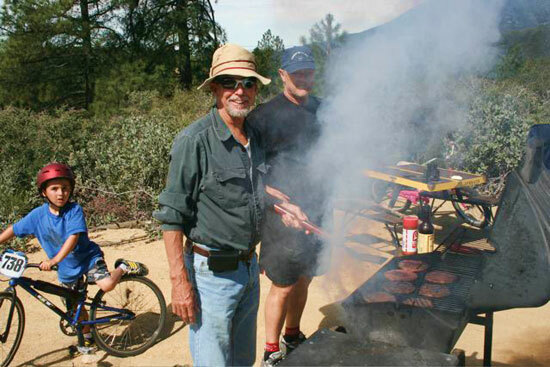 West Horse Thief Check Point Director and cooker of burgers Brian Ephraim assisted by Daniel Gallagher. 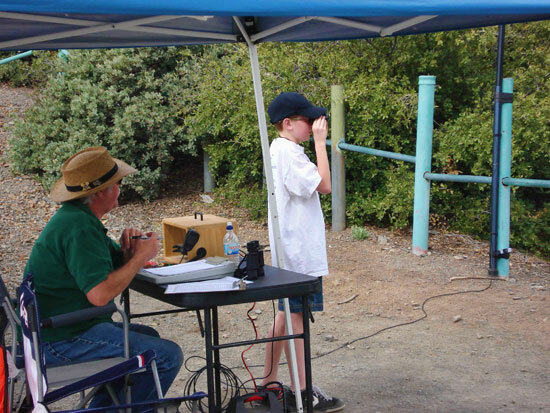 Trabuco Check Point Director Bill Hines and his assistants Dustyn Miller, Matthew Miller and Dave Zander. Warrior's Society Co-Executive Director and Finish Line Director Sherry Panttaja, Go-fer Jordyn Panttaja, Timing Director Suzanne Martin and Jim Simescu, our Hospitality Director at O'Neill Park. Barry Wood did another great job with the Counting Coup and Vision Quest event shirts. The feathers for our awards were traditionally tied by Gene Frial, the beadwork by Sherry and Tim Panattja and the leather cut and beadwork sewn on the leather by Chris Vargas. Of course we would not know what happening on the course if we did not have the support of our ham operators and the SOARA ham club. Thanks Communications Director Joe Lopez and his assistant Mike Morgan, operators Josh Avila, Sean, Clark Croisette, Heiko Peschel, Adelaide, Pat Graves, Marlyn Graves, Mikkel Hanson, Clark Croisette, Tom Hobbs, Richard Saunders, and Donna Ducharm. Special thanks to Jake Rodriguez and Debra Clark with the U.S. Forest Service for their support and thanks to the staff of O'Neill Park who have been the most wonderful hosts over the years. We also thank Forest Volunteer Jay Gentile for supervising and assisting with the event. We'd also like to thank Third District Supervisor Bill Campbell for his support of the event.